In Susan Aranda’s memoir, Waking Up Human, Aranda revisits her life experiences involving childhood trauma, heartbreak, motherhood, and aging parents. From being raised by an abusive mother, to going through two abusive marriages, to taking care of her dying father, this story of a strong woman who won’t give up will push readers to never let toxicity drag you down. Aranda’s life experiences are so vast that everyone can find something to relate to. At the end of nearly every chapter, Aranda includes a “Human lesson” that are insightful, reflective, and relatable for everyone. Her inner conflict of not always practicing what she preaches makes this a true human story. The strongest insight comes from the turmoil she faces as she cares for her dying father. As she contemplates what it means to be a good daughter, a good sister, a good mother, and a good Susan, readers will find themselves connecting to the growing pains of life, death and everything in between. The writing style mimics that of a diary, with inner dialogue and self-questioning all over. The memories she revisits often lead to a rabbit hole of more events, trauma, and questioning, which make them all the more honest, fascinating, and realistic. Some of her thoughts and stories are a bit truncated, and could have been improved with some more context or elaboration to help make them more clear to the reader. The stories in the memoir are not in chronological order, which sets a more reflective tone for the entire book. Aranda’s titling of each chapter with the number of days old that she was when the event happened is refreshing and even thought-provoking because of the concreteness that the numbers give to the age. However, at times the timeline jumps around, and this can be confusing, as the thought at the end of one chapter doesn’t always immediately continue at the beginning of the next, but it instead picks up a couple of chapters later. The memoir has a few of Aranda’s poems scattered throughout about various, often random, topics that embody her joy, confusion, and strength. These small, but mighty gems are a whimsical, fun, and sweet addition to the memoir, often lightening the mood of the otherwise serious themes that take over. Despite briefly mentioning some background on her two children, Aranda sticks to her own childhood and adult life aside from her children. It would have been a great addition to hear more about her navigation of motherhood while also balancing her own internal battles. This could have been interesting, inspiring insight for mothers or parents/guardians that are reading. In this diary-style memoir, Aranda fills her memoir with nuggets of wisdom from her life that will encourage and inspire. From Aranda’s experiences, readers will learn the importance of accepting yourself, finding your strength, and embracing peace even in life’s toughest messes. 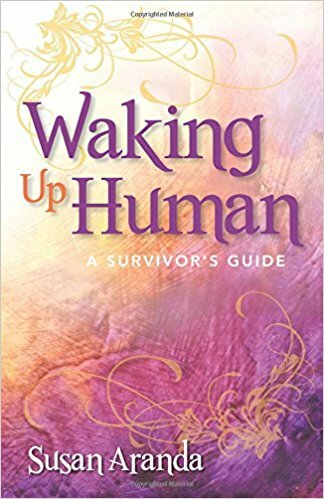 An ode to every victim, Waking Up Human is a comforting, motivating reminder that surviving is half the battle.